1.2 Bob-Omb? That's not a Bob-Omb! There are several glitches in Super Mario 64 and Super Mario 64 DS, which can be useful or just strange. Please note that they most likely were fixed in the DS remake. A really simple glitch. In Course 1 (Bob-omb Battlefield) go to the first wooden bridge. Go under it, where the coins are, then press and hold . you should be holding on to the bridge. Still holding on, make your way to the lowest point possible. Release . Mario should pull himself up through the bridge. Bob-Omb? That's not a Bob-Omb! Throw a Bob-Omb. Pick it up as it lands. You'll be holding a huge Bob-Omb. Run up the short white part of Chain Chomp's gate. Mario will be holding nothing. Go near a lot of anything. Mario will be holding whatever that anything is! In the Big Bomb Battle Field, sometimes you can't pick up the Bob-Ombs without alerting them first. Get the Wing Cap, then fly off the roof and into the cannon on the ground. Launch towards the tower as high as it will go. Keep flying towards it until you reach it. The upper part of the castle has 8 sides, so when you land on an outcrop face away from the wall that is 2nd to the left of the one that is in front (the "front" wall is the wall that was directly in front of you when you blasted from the cannon). Face away from the wall and then quickly turn around and run into it. You should fall down into a strange chamber. Remember that you'll lose half of your power. You'll be in a chamber that is completely black. If you try to enter the door, you will end up in another black room of death (in front of the castle's front door, while on the other side of the door you can see the castle walls). The only way out is to leave through a hidden wall in the chamber that's inside the castle. When you fly to the castle outcrop, you can also walk straight up to the top of the castle instead of falling through (by walking up the 3rd left from the front wall). Note: there are many black rooms of death around the castle, which can be accessed by glitches such as "The Rabbit Trick" and "Jump out of Boo's Hallway". Go to Course 8 (Shifting Sand Land). With the Pink Bob-Omb, open up the cannon in the corner of the level. Get into the cannon, move the cannon as far left and as far up as it will go. Firing directly above the sun will kill you automatically as you will land in the quick sand. Fire the cannon, do it many times. Eventually Mario's power will run out but he'll still be in the cannon. If you fire straight out into the level Mario will technically be dead but still flying. If Mario lands though he'll die and if he gets coins they won't do anything, and if Mario lands in water he'll drown automatically. Plus, if you try to get a star you will fly straight through it. Go to Course 11 (Wet-Dry World). Go in the cannon, and aim it just above the sun. Fire the cannon and do it 4 times. After the 4th time Mario's power will run out but he'll still be in the cannon. Go into the cannon outside the castle. Aim for the roof of the castle and fire the cannon. Standing next to the invisible boundary, slowly walk off the edge of the castle so that Mario will be hanging onto the edge of the castle. Climb back onto the castle's roof, but as you do, hold the and push the and . Mario's cap will disappear, and even though Mario never lost any power, a bowser face will come out of nowhere and Mario will lose a life. Some guess that this happens because when this trick is done, Mario steps outside the game's boundaries into a part of the game that doesn't exist, and the only way for the game to continue without corruption is to automatically make Mario lose a life. 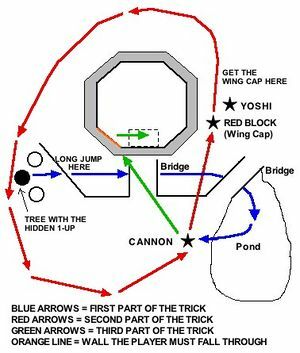 Go to the Vanish Cap Under the Moat. Either enter with, or lose, enough health to die from the fire. Touch it and quickly aim yourself for the abyss. You'll lose a life and appear in the moat, where you'll drown. Get all 120 stars, and make sure the moat in front of the castle has no water in it. Go outside of the castle, and go to the tree on the far left that contains a secret 1-UP mushroom. Climbing to the top of the tree and pressing the joystick up will make the 1-UP mushroom appear. Do this, but as soon as the mushroom appears, jump off the tree and make a long jump into the moat, while avoiding the invisible cap hole. The goal of this trick is to run away from the 1-UP mushroom as fast as possible, and not let it get to you. Without slowing down, keep making long jumps across the moat until you get to the pond. When you get to the pond make a sharp RIGHT leap into the pond as fast as possible. Swim out of the pond and get into the cannon. Aim the cannon for the castle roof and fire it. Once you land on the roof, get the winged Mario cap and fly above Yoshi. Fly straight, and fly in a circle around the perimeter of the game. This should be done to make it difficult for the mushroom to catch up. Once you've made a complete circle, you'll get back to the cannon. Go into the cannon and do the Black Room of Death glitch. When you are in the black room, the mushroom will try to get to you, but the wall will be blocking it. As a result, the mushroom will be constantly bouncing back and forth against the wall in a "C" shape, unable to get to Mario. If Mario moves left or right, the mushroom will follow Mario along the wall. If the mushroom gets stuck in the wall and Mario walks through the door, the mushroom will vanish, but if the mushroom doesn't get stuck, Mario will get it when he walks through the door. After you have 10 stars, go behind the carpet in the lobby. Quickly go on the carpet and zoom in. You'll enter Tower of the Wing Cap before you look up. This glitch takes a long time to pull off, and it only works in the Japanese version. In Bowser in the Dark World, avoid Bowser's fire breath and keep collecting coins until you get 1,000 coins (in any other version of the game it is impossible to get any more than 999 coins). You will have "M25" lives at this point. If you kill yourself, you will gain a life. If you collect a 1-Up Mushroom, you will lose a life. Go under water, to the very back at the very bottom, and open all the chests. Swim over to the sunken ship. By this time, the eel should be out of the ship's hole. Once the eel is gone, swim into the hole on the top of the ship. Open all the treasure boxes. Run over to the steps, but before you get to them, slow down to a crawl, or tip-toe. You should see a small UFO-like object floating in front of you. However, when you try to get to it, it will zip off erratically in a different direction, much like what a UFO would do. If you've opened the door to the castle's upper floors, on the spiral staircase leading to them, there's an unintended shortcut. Jump along the edge of the wall just before the left turn. Mario will grab onto an edge that shouldn't be there. You can pull him up through the wall, and he'll be right there at the door that faces the painting for Wet-Dry World. A black room of death (near the door to the second floor) can be found by doing this glitch. In Lethal Lava Land, get the shell. Surf on the lava and to the log. Mario will get crushed and lose all his health. He'll also make a very weird noise. This can also done in Snowman's Land, by surfing under the Chill Bully's platform. Activate the Wing Cap Switch. Set the star to "Footrace with Koopa the Quick". Make sure you have activated the cannons. Get the Wing Cap from the ! Block. Do a Triple Jump in front of Koopa the Quick. Make sure your third leap isn't too close to Koopa the Quick, but not too far away either. After you take off, without touching the ground, do a Ground Pound into the cannon near Koopa the Quick. Blast yourself to the Floating Island and do a Ground Pound into the cannon. Aim the cannon at the top of the mountain and fire. Make sure you land right next to the flagpole. Mario will turn his head and you will get a message from Koopa the Quick, despite the fact that he is VERY far away. The race will start, but you are already at the top of the mountain. As a result, Koopa the Quick never gets there, so your only choices are to commit suicide, collect another star, or exit the level. If you go back to the start, you will discover that Koopa the Quick is gone. If you grab the rabbit in the basement at the right angle, you will warp slightly so you are in front of the rabbit in the right position to grab it without changing which way you face. This can be exploited to warp through the star door without 30 stars by placing the rabbit in the right position and grabbing so you are on the other side of the door. This is used for beating the game with only 16 Stars. It can also get you to two different black rooms of death (One near the basement door, and the other near the door to the moat). This trick is used for "16 Star Speedruns" and there are seemingly multiple ways in doing it, the easiest would be to angle Mario facing the door you wish to pass through so that the rabbit looks as though it's inside the wall, on the corner of the door, dropping with and sliding in front of the rabbit. Just as you drop it you'll then be pushed through the wall, door and all, appearing half-way through it, grab (NOTE: This can be easier said than done at times if you happen to face the wrong direction) your lucky rabbit and continue to your next destination. As for the Star Door, this one can be done more quickly by dropping the rabbit in front of the door (yes, at the same angle) and doing a long jump into the center of the door, so that you would normally land where the rabbit is, but instead, be pushed forward through the door. Both methods do require multiple attempts. You're extremely lucky to have this happen on your first attempt. This third method also works, and has been confirmed. Place your rabbit in front of the door, now, walk through the door normally, and walk through again, just as you walk through, run back and crouch, timed right you'll easily slide right into the door. You'll be halfway through. IF the rabbit is in the right place, you can safely grab him. However, proceed with caution, as you're "treading on ice" and any sudden movements will shove you through either side of the door. Overall the 1st one may be the safest if you plan on attempting this over, and over, and over. The 2nd attempt is used in speed runs and can be performed (after practice) very quickly. The third one is simply another method that may work for you if you have trouble getting the 1st one right. Get 12 Stars so the Boo appears in the hallway. Go to the hallway where Boo is, and quickly leave the door. Enter the room with the entrance to Whomp's Fortress (or the room with the entrance to Cool, Cool Mountain). If you are in the room with the entrance to Whomp's Fortress, walk slowly to the left side of the room. If you are in the room with the entrance to Cool, Cool Mountain, walk slowly to the right side of the room. Go back into the room with the Boo, and it should be facing backward. Go into the basement and then go back into the hallway. The Boo will be facing the normal way. Enter the Whomp's Fortress or Cool, Cool Mountain room again and walk slowly to the side of the room closest to the hallway. You should hear the Boo laughing partway there. Walk slowly to the courtyard hallway again. The Boo should be gone. Enter the door to the courtyard to see a Boo floating in the middle of nowhere. Near the basement door, on the left side of the stairs, jump up at the wall. If you did it correctly, you will end up in a black room of death, under the pillar. Long jump a bit without exiting the pillar (if you exit the pillar, go back to the room with the basement door and try again). Now turn it into a backwards long jump, just like you did in the "Bypass the Last Star Door And The Endless Stairs" trick. Now you will start long jumping backwards at very high speeds. If successfully done, you will end up in another black room of death behind the castle walls. Rotate the camera until the stairs appear on the screen. You will then move backwards rapidly and get stuck in the stairs. Now jump and you will start running backwards at high speeds, behind the Star Door. This allows you to get to Bowser in the Dark World without any stars. Once you have completed Bowser in the Dark World, go down to the basement. Go onto the small staircase and do a long jump. Make sure your back is facing towards the Star Door. Turn your long jump into a backwards long jump and you'll end up near the Star Door. You will end up halfway through the Star Door, and you'll get the message saying that you need 30 stars to enter the door. Now you will start running backwards at high speeds again (Behind the portal to Dire, Dire Docks). You will be able to access Bowser in the Fire Sea with no stars. After finishing Bowser in the Fire Sea, go up to the second floor, face away from the stairs, and perform the "Bypass the Last Star Door And The Endless Stairs" glitch, and you will be able to access Bowser in the Sky. Congratulations! You have beaten the game with 0 Power Stars! It is notable that after completing Bowser in the Sky without any stars, during the ending, Princess Peach will still say, "Mario! The power of the stars is restored to the castle! ", despite the fact that you didn't get any stars. Start on the bridge outside the castle and jump down off the bridge towards the door into the basement. You will lose 8 power. Now go into the door and into the halls with fire and burn yourself once to lose three more power bar things. Now go near the Lethal Lava Land picture and jump up on a fire next to it - Time yourself right - on the last power bar, jump into the picture, by the time the screen fades, all your power should be gone. As soon as the level starts, you'll fall dead. Go to Shifting Sand land and lose your hat. Get it out of the bird's talons, but don't grab it. Now, go through a teleporter any number of times and get a wing cap. Now run up to the cap as if you are doing the "Hold Your Cap in Your Hand" glitch. But since you have a wing cap, you will be holding a wing cap in your hand. And you can still triple jump or shoot out of a cannon and start flying! This one is simple. While flying, all you have to do is land while very sharply while turning in one direction. Then start flying again and you'll be flying in that direction. For example, start flying, turn left very sharply, land while still turning. Triple jump to start flying again, and you will immediately turn left. If Mario falls asleep by the stairs on the second floor (spiral) and then jumps suddenly, he will be half way up the stairs. Shoot yourself onto a slope. Jump up the slope and dive after a few jumps. When you get to the bottom of the slope, jump once. When you do, you'll jump backwards. Hold the control stick away from the slope? When you land, you will be running backwards in the opposite direction very fast. This is best done in Big Boo's haunt, but it may work elsewhere. This works on single doors. It will not work on doors with keyholes, star doors, etc. Mario will go back to the side he came from and walk through the door. Mario will go back to the side he came from, punch, get morphed inside the door, and walk through the door, ending up a bit farther away from the door than where he normally comes out after the animation. If a character dies from enemies (not falling, fires etc), he may be pushed into a wall, block or other solid object. Similarly, if a character is left for a long time correctly near a solid object, they will fall asleep, going into the object. This one happens in Bob-omb Battlefield. Get into the tall cannon near the Koopa Troopa. Aim for the bottom of the floating island, and fire. You will need to hold up the entire time to send you flying way up in the air! You will even fly above the mountain! Eventually, you will get sent out of the level's boundaries and lose a life after about ten seconds. Go to Snowman's Land and grab the crate. Go over to the ? Block, line yourself up with the tree, and throw the box onto the platform with the Chill Bully on it. Chill Bully will walk onto the box and fall into the ice cold water. These are not well planned/made mechanics rather than actual glitches. This example is explained with Mario, Luigi and Yoshi but any three characters, provided one of them is Yoshi, will work. Yoshi goes into Mario's room and stays there. Mario goes into Luigi's room and should stay there. Luigi comes out and immediately goes back in to find Yoshi from earlier despite the fact that he should be in Mario's room. Yoshi (or the shocked Luigi) goes to Mario's room and finds him there instead of in Luigi's room where he was left The rooms obviously aren't connected otherwise you could rescue everyone at once. Animation of Picture Poker Minigame: 1)Luigi reveals cards in his hands and gives you some. 2)He puts down the deck and it disappears. 3)You hold (nothing happens) or you hit. Luigi makes the deck appear, gives you some more, and makes it disappear. 4)Luigi hits, causing an appear and disappear of the deck or, rarely, he holds and does nothing. 5)Luigi claps or shrugs. Either way, he will reveal that there are no cards on the table or in his hands or, rarely, he does nothing as it is a draw. In the casino minigames, Luigi talks but his mouth doesn't move. This glitch works in the European version. In Snowman's Land, set the star to Snowman's Silver Star, collect all five Silver Stars, then go into the igloo. You will find that all the stars have disappeared. Now, go back outside the igloo and you will find out that the stars are back. If you collect one, everything except your character will freeze. Also, the enemies will disappear completely. To get out of the level, get yourself killed by the freezing water, press , , , and at the same time to return to the title screen, or simply turn the power off. This glitch works if you are playing as Mario, Luigi, or Wario. In Snowman's Land, go to the bridge near the Snowman's head. Purposely let yourself get blown off the bridge. Now grab the crate and throw it at the snowman wearing your hat, which was blown off by the Snowman. Get your cap back, and go back to the bridge and let yourself get blown away again. This time when you throw the box at the snowman, you will find two caps. Keep losing your cap and getting it back, and the caps will multiply by two (4, 8, 16, 32, 64). If 16 or more caps appear, the DS will lag and some of the sprites will be invisible. If too many caps appear, the game freezes. However, the game will only freeze if you have Version 1. If you have Version 2, the game will not freeze, but the DS will lag and you can get more and more hats. As Yoshi, enter Tall, Tall Mountain, get Hoot the Owl, and fly to the top of the mountain. You will need to select a cap from the menu for this glitch to work. Collect the Power Flower (or Cape Feather if you get Mario's cap). Jump off the mountain and go to the area where Ukiki is. Grab him, and once the Power Flower wears off, do a cliff dive into the water (while holding Ukiki). Ukiki will steal your cap while you are in midair. Swim far away from Ukiki, and get Hoot the Owl to fly you to the top of the mountain. The glitch will fail if Ukiki gives his speech. Now hit the ? Block and collect the Power Flower. The glitch will differ depending on which character you are using. Wario: The game will freeze the instance you collect the Power Flower. Go into the courtyard as Wario, because there is a rabbit for him to catch. Position the rabbit in between the Boo and Wario, then face the Boo. Charge toward the rabbit and, if lucky, you will catch the rabbit, the Boo will solidify, and the Boo will knock the rabbit out of Wario's hands. The rabbit will not move, can't be touched, and you'll walk through the rabbit as if it was a transparent Boo. Many players use this glitch to get humorous screenshots of Wario standing inside the rabbit, making him look like he has rabbit ears. Enter Jolly Roger Bay as Wario, or use his cap, and go into the ocean cave. Make sure the star is set to Plunder in the Sunken Ship. Get the Power Flower and quickly run to the nose of the ship as fast as possible. If successfully done, you will stand under water and be able to walk around. The only way to escape is to die, enter the ocean cave, or exit the level. In Dire, Dire Docks, go to the submarine dock area and swim to the back of Bowser's Sub. Do a jump and a ground pound under one of the propellers sticking out of the back. If done correctly, you will be forced underwater and lose half your health. You will be able to walk underwater, but you can't get the Star in the jet stream. This glitch will only work if Bowser's Sub is still there. In Tall, Tall Mountain, set the star to any mission with Hoot the Owl in it. Get Hoot to fly you over to the Scary 'Shrooms section. Now go onto the warp mushroom and the entire course will be filled with water! Avoid the wind and the water at the bottom of the mountain, as the glitch will end if this happens. If you do this glitch as Yoshi, you can carry a Chuckya! To do this, go over to where the Chuckya, being careful not to let the water disappear. Press to grab the Chuckya as if it was a Koopa Shell. The Koopa Shell music will be playing, and you will be swimming around while carrying a Chuckya. As the water disappears, you will still be carrying the Chuckya. In the room with the entrance to Tick Tock Clock, go over to the staircase and go onto the second step. Do a slide kick against the wall and you will fall through the staircase and die. Rarely, however, you will get shot up into the sky and can guide yourself to Bowser in The Sky. This means you can beat the game with as little as 50 stars. You will need to be Mario, Luigi, or Wario to do this glitch. Near the cannon outside the castle, slide head first into one of the trees. Half of your body will be above ground, and the other half will be under the ground. Now swim over to the cannon and shoot yourself to the roof. This glitch only works if the water hasn't been drained from the moat. You will need to be Mario, Luigi, or Wario to do this glitch. Do the Access the Castle Roof with Only 8 Stars glitch, but this time don't go into the cannon. Instead, swim deep under the water (below the moat) and enter the basement door. Make sure you enter it from behind. The screen will go white as if you entered a painting. You will appear in the castle basement. If you haven't completed Bowser in the Dark World, going up to the basement door will just result in a message box appearing, saying that you need the key. If you do this glitch with 30 Power Stars, you can complete Bowser in the Fire Sea without completing Bowser in the Dark World. If a Mario Brother jumps fatally off the floating island in the Bob-Bomb area, they will either have audio cut off in the middle of it or no audio at all. This page was last edited on 16 April 2019, at 23:19. This page has been accessed 108,540 times.